Valentino will launch Valentina Pink, a new fragrance for women, in March. Valentina Pink is a flanker to 2011′s Valentina (and see also: Valentina Acqua Floreale, Valentina Assoluto, Valentina Oud Assoluto and Valentina Rosa Assoluto). Valentina Pink was developed by perfumers Daphné Bugey and Fabrice Pellegrin. Notes for the fruity floral gourmand include strawberry, blackberry musk, rose, peony, cashmeran, amber and praline. 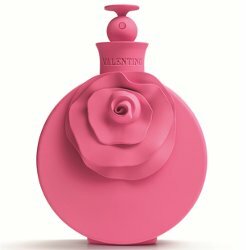 Valentino Valentina Pink is a limited edition, and will be available in 50 ml Eau de Parfum. Oh this actually looks rather adorable! Plus, gourmand is my thing! Maybe it is the color more than anything that reads soap dispenser. I can see that. It also looks like it could be a perfume from the girl aisle of a toy store. You know, Barbie perfume! Eeek! That is more pink than I can handle. I would like to try this perfume, though. That’s really pink. Agree, it’s very Barbie or My Little Pony. It also looks like pink rubber from the pic. lol. Finally, a bottle made of pink erasers. Looks like some kind of Greek amphora at the top! I just want to touch this bottle to check out the texture – rubber? clay?